Did you know that experts estimate there will be 1.4 million computing jobs open in 2020 and only 400,000 students to fill them? Since 2013, Computer Science Education Week has been held during the second week of December. This week is designed to make students and teachers more aware of computer science and the importance of building computing skills at early age. While enrolling all students in regular coding and other computer science classes may be the ideal solution, you can still take small steps to encourage students to take notice of computer science and help them discover how much fun it can be. In 2014, the Hour of Code gained a lot of publicity when President Obama sat down to join students as part of the event. This year, and all year long, you can also participate in an hour of code. Organize your own Hour of Code event at your school or join up with an existing group. If you’re not sure of what you’re doing, search for local volunteers to come work with your students during the event. For a less formal option, simply have your students complete one of the coding tutorials available through Code.org where they code with popular characters from Star Wars, Minecraft, or even Anna and Elsa from Frozen. Students often hear that there are tons of job in the tech industry, but do they know what those jobs look like? 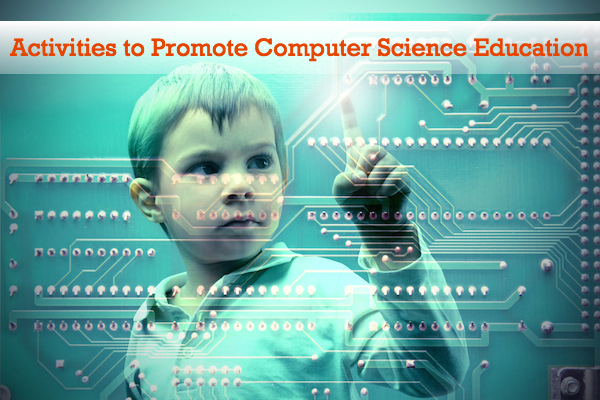 Invite parents and other community members to your school for a Computer Science Career Day. Your speakers can rotate among classes to share what their jobs are like or they can set up tables in booths and talk to students as they approach them. If you can’t find individuals to come to school, then have students research different tech jobs or companies and share their findings with the class. While a MaKey MaKey kit does not involve a lot of coding, it does encourage kids to think outside of the box and imagine the cool things they can do when they combine computers with everyday objects. You can turn students’ experiments with the kit into writing assignments, science experiments, marketing proposals, and other educational activities. Your students may not be interested in computer science, but they may be interested in playing football, playing with their toys, or drawing and coloring. Chances are they don’t realize how much computer science can play a role in these activities. For example, it takes a lot of technology to take video of a football game, freeze it, and move it around on the screen. Give students the task of researching how technology plays a role in their favorite hobbies. They may discover that coders help create 3D models of their favorite toys or that they can create some amazing art with lines of code. While learning how to code can benefit students, thinking in the language of coding is even more important. By promoting logic and creative thinking skills, you can give students the mental skills they’ll need to be successful in a computer science field. CS Unplugged offers a large selection of activities designed to help kids develop these critical thinking skills. These include tasks such as learning about The Turing Test and discovering how difficult it is for computers to draw lines and circles. For more resources to help you bring Computer Science into the classroom, check out Code.org and the Computer Science Education Week website. If you use some of these activities in your classroom, share them to Facebook or Twitter with the hashtags #CSEdWeek and #HourOfCode. When and where is the Computer Science week? In 2015, it is December 7-14. The event isn’t associated with a physical location. Thanks! Very good options. Love the links!